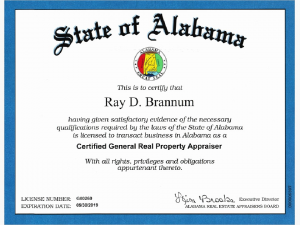 Ray Brannum, Certified General Appraiser, G00260 Expires 9/30/2019. Attended the University of Alabama, Selma, Alabama 1953/1955. Gadsden State Jr. College, received commercial flight instructor designation in 1967. Snead State Jr. College, Boaz, Al. received certification to qualify for Real Estate Broker’s license 1974. Penn State University-Introduction to Appraising Real Property- Society of Real Estate Appraisers in June 1986. Ohio State University-Applied Residential Property Valuation-Society of Real Estate Appraisers October of 1986. Successfully completed 4 year CLEP at University of Alabama, Huntsville, Alabama 1992. Since 1992 I have maintained or exceeded the 28 hours of continuing education requirement by the Alabama Appraisal Board for license renewal period. I currently hold a Certified General Real Property License that is effective through September 30, 2019.